I’ve really been getting into gel manicures lately, and I’ve recently been trying out the Red Carpet Manicure set. Red Carpet Manicure sell everything you need to create your own professional manicure in the comfort of your home, and I’ve just started practicing with their Starter Kit and a couple of their Gel Polishes. The shades on the above picture from left to right are – Fake Bake, Make a Statement and I’m So Honored. Ok so how amazing does Jessie J look here? She’s actually sporting the one of the shades I have – Fake Bake – at the American Music Awards in November. I’ve been given instructions on how this look was created and I’m going to attempt to copy it. It can’t be too hard… right? Kimmie used the Red Carpet Manicure Gel Polish Pro Kit to apply Jessie’s gel manicure. 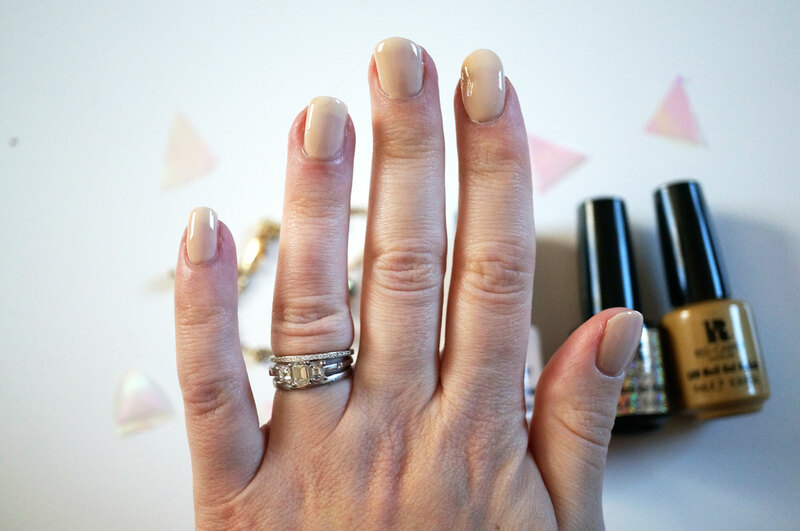 She shaped Jessie’s nails into an almond shape and used Purify Pre & Post Application Cleanser. Kimmie applied a thin coat of Structure Base Coat Gel to four nails, leaving the thumbs for last and cured in LED Light for 30 seconds. Kimmie applied a thin coat of RCM LED Nail Gel Polish in Fake Bake and cured for 45 seconds in the Professional LED Light. Repeated for second coat. For her show time look, Kimmie removed the Fake Bake polish with RCM Remove Kit and then followed the same process: she cured one coat of RCM I’m So Honored, cured for 45 seconds, and then painted one coat of RCM Make A Statement, and cured for another 45 seconds. Kimmie then applied a thin coat of Brilliance Seal & Shine Top Coat Gel and cure for 45 seconds in the professional LED Light. To finish, Kimmie removed tacky residue with Purify Pre & Post Application Cleanser and applied Revitalize Nourishing Cuticle Oil to hydrate the nails. 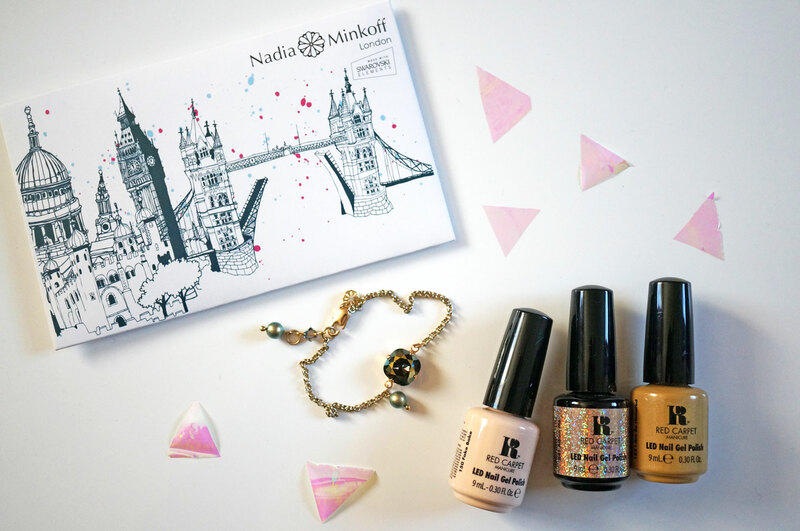 I would also like to add that even though my nails don’t exactly look amazing, I cannot fault the products at all. Both the polish and LED light were super easy to use – I just need to practice my application technique! The LED light actually has a USB connection too so I just plugged it into my laptop, which really was super convenient. I also really do love the shade Fake Bake, it’s a lovely light warm cream, and it’s one of the few pale colours that doesn’t make my skin look even whiter than it already is! I also thought I’d take this opportunity to show you my beautiful new bracelet from Nadia Minkoff. 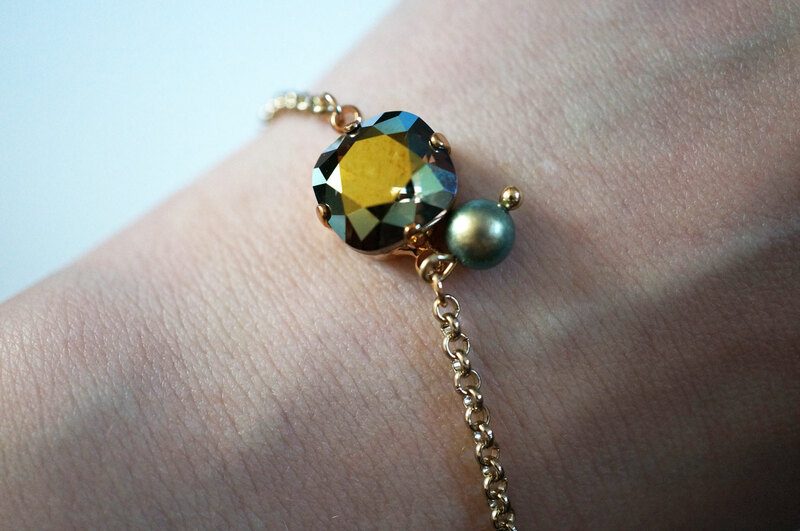 This is the Single Stone Bracelet in Iridescent Green. It has a simple silver tone chain, with an amazing iridescent Swarovski cushion cut crystal that changes colour when it’s facets catch the light. There’s also a pretty Swarovski glass pearl added to match the stone and the fastener is finished with a Nadia Minkoff flower set with a single crystal. I’m looking forward to wearing this out over the Christmas holidays 🙂 It’s described as ‘A friendship bracelet with sparkle and a twist’ I never even thought of it as a friendship bracelet, but it really would make a wonderful gift. Previous Post Text Santa! A Worth While Cause.